Austin and the surrounding area is home to some amazing Resort Hotels! (We’re kind of spoiled like that.) From gorgeous lake views to stunning hill country panoramas, you can find just about anything to suit your needs, within 45 minutes or so from our fine city. If you’re wondering what the difference is between a Resort Hotel and a regular hotel, a Resort is typically considered a recreational complex that is the center of an attraction – a beach, a swimming pool, an extraordinary restaurant, etc. A Resort Hotel combines the amenities of a regular hotel AND a resort. A Resort Hotel typically has a ton of amenities, like a world class spa, on site activities, restaurants, meeting facilities, and more. You can basically stay and relax for days without needing to leave, because they have everything on site that you could possibly need. And all of these points are exactly what make a Resort Hotel the ideal place to host your wedding! One of biggest reasons that our couples first consider a Resort Hotel for their wedding is convenience. Having one central place for all of their guests to stay is a great perk for most couples. And since most Resort Hotels offer great discounted rates for large blocks of rooms for a wedding, it just makes sense. Beyond the ease of room blocking, having all of your guests in one central location affords you the opportunity to spend more time with the people that most likely traveled from all over the globe to see you at your wedding. When we travel as guests to a wedding, my husband and I often arrive on Friday late in the afternoon, rush from the airport to our hotel, quickly unpack, shower, dress, and grab a taxi to the rehearsal (or rehearsal dinner). As soon as this is over we practically pass out in our hotel room (from exhaustion of the day of traveling and activities). The next morning we pack a small bag of all of the things we think we might need throughout the day, travel to the various wedding day activities (possibly a luncheon), rush back to our hotel room to shower and get ready for the wedding, then hop on the shuttle to the venue (or grab another taxi). It’s down right exhausting! With a Resort Hotel wedding your guests get to bypass all of the chaotic running around town because you have the option to host your rehearsal dinner on site. Now, your guests simply check in and relax for a while until they walk downstairs to the rehearsal and dinner. When it’s over they can lounge in the hot tub or hang out at the pool before walking back to their room to retire for the evening. So much more enjoyable! With a Resort Hotel Wedding everything is on site, so you’re usually only working with a couple staff members for everything, as opposed to multiple locations, staff and details! Whether you’re planning a bridal luncheon, a Mendhi, or a Welcome Party, there is likely to be a space for all of these. Most Resort Hotels have a variety of indoor and outdoor locations to choose from, so you’ll be able to have multiple events in various locations on the property and each will feel special and unique. And no need to print and mail a ton of little directional maps to places all over town – your guests can simply walk to each activity without having the added expense of a car rental or taxi service. Since your guests will be staying in one location, you will be able to spend more time with them. Time hanging out at the pool or relaxing together in the on site spa will be memories you will be making for a lifetime. Most weddings will have a combination of guest types – singles, couples, families with children, older guests with physical limitations, and more. Resort Hotels are able to accommodate all of them! Most will have restaurants and bars on site that stay open late (like TRIO at Four Seasons Austin), child friendly family activities (like usage of the bicycles, the smores pits, and Camp Hyatt at Hyatt Lost Pines), and all of our area hotels have rooms and spaces that are wheelchair accessible. It gets a little difficult to find an appropriate venue when you have a large group. Even groups over 150 guests have a difficult time finding a venue with enough space in our area, so groups with 300 or more often must select a Hotel or Resort Hotel for their wedding out of necessity. Resort Hotels often have a ton of large ballroom space and outdoor space, making it the ideal option for larger guest counts. Though you might not have considered yet where you’ll stay on your wedding night, a large Suite is often included at no charge to the wedding couple for the night of their wedding. This could result in a savings of hundreds of dollars! Additionally, most Resort Hotels will include 2 large meeting or gathering rooms for the the couple and their wedding party members to get ready in on the wedding day, resulting in even more savings – and a designated place to spread out in while getting dressed and relaxing before the ceremony. Another financial perk you may not have considered is points. Oh how we love our hotel points! At most chain related Hotels you will get credit for all purchases made at their location – including your entire catering expenses – that you can use on your honeymoon! While this is the last item we’re covering, it is definitely not the least. You will likely have the option of hosting all of your activities – ceremony through reception – outdoors at the various properties. And this is ideal for those that want a complete outdoor wedding. But what if it rains? Or becomes bitterly cold or suffocatingly hot? That’s not an issue here, as there is ALWAYS a built in rain and weather back up plan. In case of inclement weather, we can simply move the locations indoors. This is a big issue with typical outdoor wedding venues. While they may have plenty of outdoor space, very few local venues have the capability to accommodate 300 guests indoors. If you’re curious about the cost difference between a Resort Hotel Wedding and a Venue Wedding, check out our other BLOG POST HERE. Yes, I know this was a really long blog today. But in my defense, it’s a really lengthy topic to address. I hope that you were able to gain some insight into the many perks you receive from hosting a Resort Hotel wedding. If you have any questions about your own Resort Hotel wedding, we’d love to hear from you. We invite you to leave a comment in the comment section below or give us a call any time at #512-902-2743. 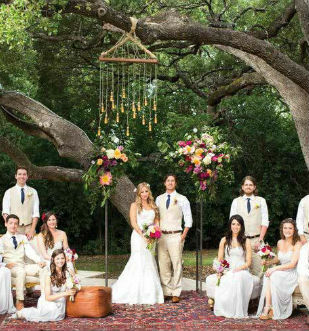 Do you want to learn more about what the Resort Hotel, Hyatt Lost Pines, has to offer for weddings? Well you’re in luck, because we have a whole page dedicated to everything you need to know about hosting your wedding there including downloadable floor plans! Check out our Hyatt Lost Pines page here.